Dalton Park is an outlet shopping development in Murton (County Durham, UK) with a total construction cost of approximately £20M that features a variety of fabric membrane canopies. Two lines of single shop units are arranged on either side of a central street. The street is partially covered by seven fabric canopies based on single and multiple conic forms. The main canopies are 60m long by 14m wide and consist of four linked conics supported by flying masts, which are supported in turn by cables back to the main high-level steelwork. Two of the canopies use four inclined masts and two use straight masts. The edges of the fabric membranes are supported by boundary cables along the long sides, with the short sides being clamped directly to inclined steel arches. Two separate smaller canopies (approximately 20m square) are located at the bends in the street. These form single low conics, with large elliptical rings suspended from cable-stayed masts. The entrance canopy is approximately 16m by 18m and consists of a single conic formed with a central inclined flying mast. 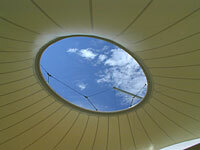 For each of the canopies all of the internal forces from the membrane are resolved by a perimeter steel frame. This frame is supported both vertically and laterally by brackets from the main steelwork superstructure to the shop units on either side of the street. The canopies are designed to provide shelter from the wind and rain, and shade from the sun, whilst providing a light, airy outdoor environment. The finished structure provides an architecturally striking solution both from inside and out, with the shapes reflecting the site’s coastal location as well as providing the development with a unique and recognisable form. The total area of stressed membrane is just over 5000m², costing approximately £1.25M for the fabric, cables and dedicated steelwork. Polyester fabric with a PVC coating was used for a variety of reasons including its low cost and resistance to damage during fabrication and erection. The low shear stiffness of PVC-polyester fabric enables the double curvature of the conic forms to be achieved with little risk of wrinkling. The fabric chosen for this project has a light transmission of approximately 8% which is sufficient to provide a good level of diffuse daylight. The PVC coating provides excellent water-resistance over the life of the fabric, which is anticipated to be well in excess of 15 years. The performance of PVC-coated polyester fabric when exposed to fire is well known: the material will retreat from a flame, allowing the canopy to be self-venting. 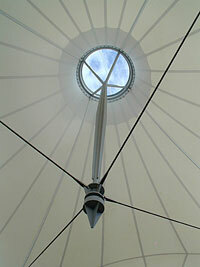 The edges of the fabric canopies at Dalton Park are supported variously by steel edge cables, membrane plates and continuous connections to steel circular hollow sections at both the rings and arches. The membrane plates hold the fabric in place between two steel plates that are bolted together, with short sections of steel tube welded to the bottom plate to facilitate connection to the edge cables. Adjustment of the edge cable lengths is provided via threaded stud terminals within these tubes. A layer of fabric reinforcement is used in these areas, as stress concentrations can occur. Similarly, a welded double-layer of fabric is used around the top rings of the conics to strengthen the membrane as required. The relatively large deflections and rotations expected in the fabric structure under external loads are accommodated with stainless steel toggles between the membrane plates and the perimeter frame. These connections allow for site adjustment and tolerance or for future retensioning. The membrane itself deflects significantly under load, with predicted displacements in the middle of the panels occasionally in excess of 500mm under extreme wind conditions. Typical serviceability considerations include the potential for temporary destresssing of the membrane or inversion of the fabric surface. Determination of the minimal surface shape (form finding) and large displacement behaviour under load requires nonlinear finite element analysis. For the Dalton Park canopies GSA finite element software with the GSRelax non-linear solver was used. This is based on the Dynamic Relaxation algorithm and a constant strain triangle formulation. The analysis of wind and snow loading on the structure – together with the experience of the designer – determines the level of prestress required to maintain tension in the membrane. For flatter areas of the roof (e.g. between conics on the main canopy) it is vital to ensure that the fabric shape is maintained and ponding of rainwater or snow-melt cannot occur. To achieve these criteria, the nominal target prestress for Dalton Park was 1.5kN/m for the main canopies, 3kN/m for the knuckle spaces and 2kN/m for the entrance canopy, reflecting the different canopy geometries. The tensile and shear stresses in the fabric due to prestress are combined with appropriate combinations of snow and wind loading to check fabric strength and provide loads for the design of the supporting cables and steelwork. Fabric membrane surfaces must be subdivided into panels that can be cut from a flat roll of fabric. The panels are subsequently welded together in a controlled environment to produce the complete canopy ready for delivery to site and installation. The membrane behaves in a highly non-linear fashion during prestressing, with a complex interaction occurring between the warp and weft yarns. The fabric panels must therefore be compensated such that after prestressing they have the correct dimensions for the roof geometry. 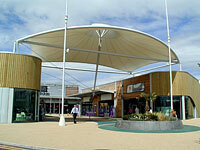 For each canopy at Dalton Park the fabric panels were cut, welded and brought to site as a single unit. The fabric membranes were laid out on site, and fixed to the flying masts and edge cables. Each canopy was individually lifted into position using up to four cranes. The edges of the canopy were then fixed back to the main steelwork, with the rods supporting the flying masts also installed prior to the canopy being released from the cranes. Each flying mast was jacked-up to achieve the desired prestress in the fabric and cables/rods. This tensioning process took approximately one month for all of the canopies to be installed. During this time dynamic loading from strong winds effectively ‘conditioned’ the fabric, taking out much of the initial creep. Non-linear fabric behaviour, large displacements and the use of membrane action to resist loads require a fundamentally different approach to structural design compared to traditional roof structures. Fabric structures require an experienced designer, specialist software such as GSA Fabric and a skilled contractor to take the project from Architect’s sketch to realisation. The complex design process results in a deceptively simple, lightweight and elegant structure.